Experience the beauty, allure, and hospi­tality of provincial France, at an easy pace and in a unique style. 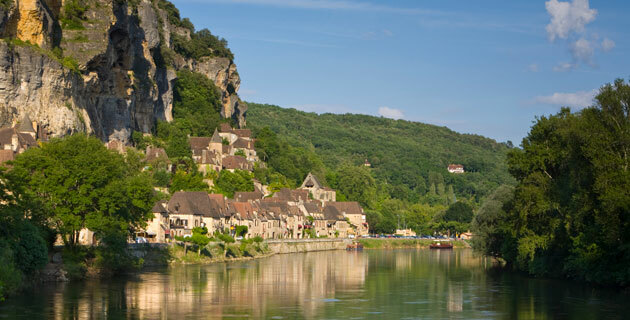 Anchored by stays in vibrant Toulouse and enchanting Paris, the journey ­features diverse Languedoc, the remote Dordogne, the lovely Loire Valley, and historic Normandy as we stay in charming rural inns and small country hotels. It’s a small group tour de force! Single travelers please add $995 Oct; $1,195 all other dates. Your $375 deposit is fully refundable up to 95 days prior to departure. All 2019 tour prices above (excluding airline taxes, surcharges, and fees) are guaranteed. Well-located in the heart of Toulouse’s “Ville Rose” on Capitole Square, the 162-room Crowne Plaza Toulouse offers a restaurant, cocktail lounge, complimentary Wi-Fi internet access, and laundry and dry cleaning services. Air-conditioned guest rooms have private bath with hair dryer, in-room safe, minibar, TV, and phone. Au Grand Hotel de Sarlat sits just north of Sarlat’s medieval city center, only five minutes’ walking distance from this well-preserved 14th century town. Boasting lovely manicured gardens and an outdoor heated swimming pool, the hotel also features a bar (with a public piano), fitness center, spa, sauna, laundry and dry cleaning services (for a fee), and complimentary Wi-Fi internet access. Air-conditioned guest rooms are split among two separate buildings: our rooms in the Pavillon de Selves have private bath with hair dryer, TV, and phone. Overlooking the Loire River, the charming 18th-century Hôtel Anne d’Anjou stands with its original wood, glass, and freestone moldings that date to the Louis XVI, Restoration, and Empire periods. Minutes from the town’s center, the 45-room hotel has a restaurant and bar, lounge, complimentary Wi-Fi internet access, laundry service, and garden. Guest rooms come in all shapes and sizes, but all have private bath with hair dryer, minibar, TV, and phone. Dating to the 13th and 15th centuries, this rustic restored farmhouse is located in a rural setting outside the village of Crépon. The hotel features a bar, a medieval dining room with vaulted ceilings, and complimentary Wi-Fi internet access. The fine food served here is typical of the region. Each of the 35 Normandy-style bedrooms, decorated in period furniture, has a private bath with hair dryer, TV, and phone. There is no elevator. Ideally located between the Champs Élysées and Avenue Georges-V, close to entertainment, restaurants, and shops, the 104-room Hôtel Château Frontenac offers a bar and breakfast room, laundry and dry cleaning services (for a fee), and complimentary Wi-Fi internet access. Air-conditioned guest rooms have private bath with hair dryer, minibar, in-room safe, TV, and phone. Savor the City of Light on your own time, at your own pace. Time travel through France by way of its finest castles, chateaux, cathedrals and monasteries. This unusual travelogue is an invaluable companion for traveling in Paris, southern France, the Dordogne and the Loire Valley, combining personal observation with large doses of well-presented history. In elegant, insightful prose, novelist Gordon meditates on the courageous and complex young girl and the iconic status she has acquired. This collection contains literary gems from all corners of France by a select group of 20th-century French writers from Colette to Simenon. This superb guide to all of France features color photography, dozens of excellent local maps and a region-by-region synopsis of the country’s attractions. Handsome, convenient and up-to date, this is the guide to carry. A colorful, accurate and up-to-date map of France at a scale of 1:1,000,000. A compact, illustrated guide in the popular series, featuring favorite attractions. With handy pullout map. This handy phrasebook focuses on pronunciation, basic grammar and essential vocabulary for the traveler. An evocative and beautifully written survey of French food. First published in 1958 and revised in the mid-1970s, the book covers the important regions of French cuisine by dividing them into domains of Butter (northern France), Fat (Alsace) and Oil (the south). Written by the best-selling historian Stephen Ambrose, this well-researched narrative draws together interviews and government documents to tell the gripping tale of D-Day. A vibrant chronicle of how Parisian rulers transformed the city into a cosmopolitan metropolis. A spirited, meticulously researched chronicle that recreates the life and world of Eleanor of Aquitaine in 12th-century Europe. A Harvard University Press Classic, first published in 1950. Illustrated with photographs from all seasons, this profile of Monet’s home in Normandy takes readers into the artist’s life and sanctuary. Adrien Goet explains how the home and gardens were designed, where Monet spent his time and much more. First published at the turn of the century, this classic work is a meditation on the medieval world as reflected through its most famous religious structures. Two Canadian journalists tackle the contradictions and complexities of the French character, paying particular attention to the question of why the French resist globalization. Art historian Hicks investigates the production and politics of the Bayeux Tapestry, tracing its survival from medieval times through the present day. O’Shea (The Perfect Heresy) turns the tale of Friar Bernard Delicieux and a city that stood against Pope Boniface VIII, Machiavellian French King Philip the Fair and grand inquisitor Bernard Gui into a thrilling tale of resistance in medieval Languedoc. In this tale of art, paleontology and discovery, Curtis introduces the masterworks of cave art in France and Spain, visiting Altamira, Lascaux, Les Trois-Freres, Cosquer, Chauvet and others. Gopnik writes with candor and humor about Paris and Parisian ways in these charming reflections on adapting to life in glorious exile. A treasure for anyone interested in Parisian cafe society and its luminaries circa 1925. Hemingway includes sharp portraits of Gertrude Stein, Ezra Pound, F. Scott Fitzgerald, Ford Maddox Ford and others who idled on their way to greatness. After losing his Paris apartment, Rosenblum, a born storyteller, takes to a houseboat moored on the Seine. The result is this entertaining tour of the places and people he encounters during his explorations along the river. You can practically smell the paint in Stephanie Cowell’s lyrical novel — peopled by not just Claude Monet and the love of his life, Camille, but also by his friends Bazille, Renoir, Pissaro and Manet. Wan crafts a suspenseful, elegant tale of food, romance and murder out of a search for a long-lost woman in the Dordogne. Flaubert meditates on humanity, Fitzgerald revels in “la vie belle” and many other great writers explore Paris in these classic stories. Part of the Everyman’s Pocket Classics series.